The author says that very often when you found yourself stuck it’s because of a crucial conversation that you are not having or are not having well. What differentiates great companies from good ones, they say, is how they manage crucial conversations. In great companies crucial conversations take place and problems are never swept under the rag. 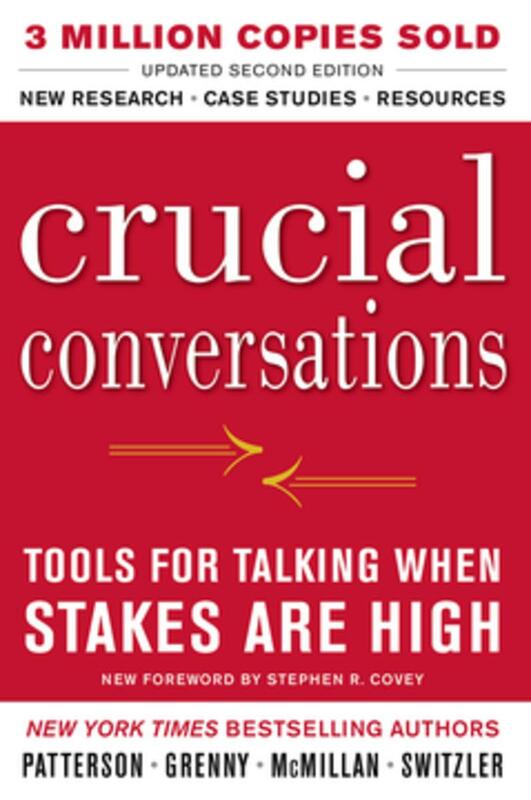 Chapter 1: What’s A Crucial Conversation? The author says the irony is that the more important the conversations, the more poorly we handle them. It’s because our emotions take over and our pre-cortex, the region that makes us humans basically, shuts off. And we end up behaving like animals exactly when behaving like human beings is most important. The authors say that the two most common destructive patterns relating to crucial relationships are silence and violence. We either avoid to engage in crucial conversations or we do so hyper-emotionally and in violent ways. Often we also swing between the two. The more we stay silent, the more we are likely to eventually explode. Silence is much more common, and it’s very dangerous when it becomes company’s culture. Dialogue is the exchange of meaning when people have a conversation. The author uses an imaginary “pool” at the center among the people conversing. The more people can be open and put information inside the pool, the more likely it is we will reach good decisions. This is basically the principle of why Ray Dalio pushed so hard in Bridgewater to have a culture of radical transparency and radical open mindedness where people are expected to speak up and share opinions. Starting with the heart means to start within ourselves first. We need to examine our own personal contribution in the problem. The authors also suggest that you focus and ask yourself what you really want. What you want for yourself, for the other(s) and for the relationship(s). Looking within yourself and asking what you really want is also a great way to avoid damaging feelings such as the need to look good and to “win” the argument. The authors also remind us that we often see difficult conversations as two opposing choices that cannot co-exist. Or two bad decisions. It’s howerver not often the case. To look beyond the appearances it’s often great to ask questions such as “how can I do X and still do Y”. or “how can I do X without hurting Y”. Learning to spot and recognize the sign of a crucial conversation is not always easy, but it’s an essential part of being successful at crucial conversations. Especially look for signs of silence and violence. The authors say that when we are dealing with a crucial conversation we often feel that our message and our words are the problem. So we water it down and look for safer alternatives. And we don’t say what we really want to say. The key though is exactly that: being able to say what we want and need to say the most. The best way to do so is to make the conversation safe. When our conversation partners know and believe both of those elements are in place, they can relax and really listen to what you’re saying without defensive barriers. When they don’t believe those two are in place, we get silence or violence. The authors say that our emotions come from the stories we make up, not really from reality and facts. The core of this chapter is to encourage us to look at the facts and the stories from different and more complete angles. The authors say that when we engage in crucial conversations it’s easy getting emotional and upset. When we do that, there seem to be a tendency where we take the story the worst possible way., which further escalates emotions. To break the negative patters we must then look at all other possible stories and change our judgments and conclusions. As we expand the breadth of our stories, we become calmer and better prepared to having crucial conversations. The authors also recommend you start crucial conversations from facts -as also suggested in Difficult Conversations-. It will be less personal and it will make you more credible. I also particularly like the suggestion of starting with what you agree, so that you begin on a positive note. They propose the acronym ABC, meaning Agree, Build (instead of tearing down, “yes and..”), compare (what you see differently). When people fall into silence or violence we need to encourage to take the same healthier steps that we want to take for ourselves. The authors say that we need to move beyond the simple expression of their emotions to their facts and stories. A great way is to get curious. Ask yourself: why should a reasonable person like X act and behave like this? What brought them there? And then get down to find out what happened. Understanding each other and a positive atmosphere are not our end goals. Those are the means to an end. Once we have no silence or violence and once we have a big pool of shared meaning it’s time to move to solutions. Always keep a record of the decisions and keep one single person accountable for a single result. The authors say most people believe those neat principles sound good but don’t really apply to their personal cases. Well, they do. They then proceed to present several case studies to walk us through them. Analyze the crucial conversations after they happened for lessons learned. Think about patterns in your relationships.